Those who newly register with Bingos receive a £1 Sign-Up Bonus immediately upon sign up, with no restrictions or qualification required to use the full amount in play. This generous “hello” is followed up by a First Deposit Bonus of £25 free, just for funding a new account with a minimum of £10. Bingos will accept deposits from major credit and debit cards, as well as Ukash, Moneybookers, NETELLER and PaySafeCard. Owned by the United Kingdom’s largest interactive TV gaming company, London-based NetPlay TV plc, Bingos.co.uk launched in 2003. Its longevity makes it one of the most established online bingo sites in the U.K., with English used as the primary language and the British pound as the main currency. Day-today operations are handled by NetPlayTV Group Ltd., under license and regulation by the Alderney Gambling Control Commission. Three Euro-denominated mirror sites have since been established, one each for Italy and Poland through Bingos.com and a separate site, ElBingo.com, for Spain. In total, eight unique sites are linked into the NetPlay network, which also includes BingoFriends.com, Supercasino.com, and CasinoJoker.com. No download is needed to access the games or wager. 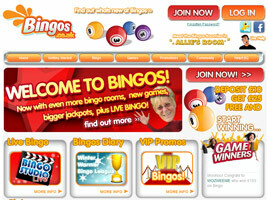 The Bingos.co.uk web site offers ten fun and friendly bingo rooms to play in. Over the years, it has attracted a significant share of the 400,000+ active players in the U.K. market, with bingo tickets starting at just 1p and new games starting every six minutes. There is a team of entertaining chat masters on hand, too, making players feel welcome in the online bingo chat rooms. For those who fancy classic 90-ball bingo, Allie’s Room is open from 8am to 2am every day of the week, featuring such “Daily Treats” as three hours of penny bingo games on Mondays and three hours of buy-one-get-one-free games on Wednesdays. There are five big games giving away a guaranteed £250 each evening, starting on the half hour from 7pm to 9pm; tickets are just 25p apiece. Traditional 90-ball Bingo is also available 24 hours a day in Rooms 1 and 2, as well as in Bingo Studio Live from midday till midnight. There is one 80-ball bingo room open from 9am to 9pm, and Speed Bingo takes place from 3pm till 8pm daily. For those who prefer 75-ball bingo, there are two versions provided: the popular U.S. form with its patterns, and the British variation awarding prizes strictly for one-line, two-line and full house winners. Two special rooms have also been set aside for novelty games: Joker Jackpot Bingo played with a deck of cards and Deal or no Deal Bingo featuring hidden value boxes. Of course, side games are ongoing throughout the day at Bingos. They include the latest slots, scratch cards, and casino games. Three multiplayer slots and 16 progressives can be found among the choices offered. The latter have jackpots ranging from £200,000 to Big Top Tombola, currently values at over £1.3 million. Among the many permanent promotions on the web site are monthly VIP Bingo Specials, ranging from extra deposit bonuses and slots specials to event invitations plus birthday and Christmas gifts. Daily treats include Tuppence Tuesdays, Free Fridays complimentary scratchcards, and Super Value Sunday tickets costing just 1p, 2p, or 3p. New bonuses are being dreamt up monthly, such as Girl Power and Ladies Night offers of 20% cash back on cash stakes in real time, worth up to £20. One of the most popular promotions of late has been the introduction of three Bingo Linx games played every day with an £8,000 prize pool, supplemented by a Super Bingo Linx game on the last Sunday of each month. Those who invite their friends to sign up at Bingos are eligible for a £10 Refer-a-Friend Bonus. Organized bingo tournaments, chat quizzes, and team bingo can be found here, too, making Bingos.co.uk one of the liveliest and most lucrative sites on the Internet.